#TGIF! This dispatch brought to you by your favorite seagull. And behold, we are likely the only Hamptons publication bringing you…cordless drills. Forget hot yoga, or green juices, or second master suites: Today, we feature the Power Tool Show, from 7 a.m. to 2 p.m. at Riverhead Building Supply in East Hampton, pictured above (which, for the record, pipes in excellent music for crack-of-dawn shoppers). From what we understand, there will be “special pricing on the latest power tools.” We are hopeful, but doubtful, for wine and cheese. Uber is indeed making a comeback, at least in the Hamptons (the company — sort of a poster child for everything that’s wrong in Silicon Valley — has had a rough year). Perhaps we’ll re-install the app. Expect to be able to hail an Uber or Lyft on or about June 29. The results are IN for the East Hampton Town’s hamlet studies, which chart how business districts could evolve. Recommendations have been met with excitement, apprehension and cynicism, according to 27East.com. It’s not clear if the visions will come to fruition before we’re underwater. On tap for the weekend…. –Learn to be a standup paddleboard instructor (or just look like one) via the Academy of Surf Instructors courses going on at Paddle Diva in East Hampton this weekend. “Learn from the team who put SUP on the map,” Paddle Diva (modestly?) says…. 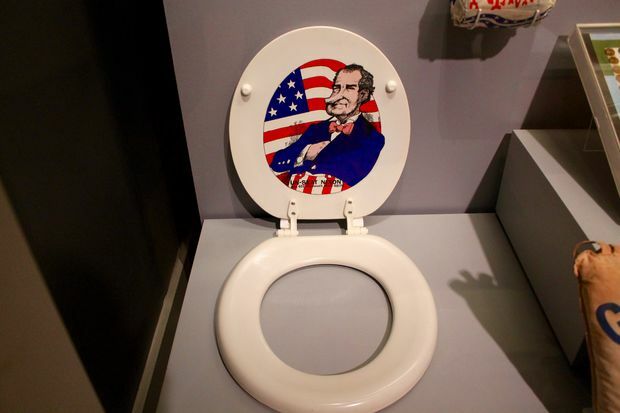 –If you’re not yet sick of politics, or perhaps long for the folksier days when a candidate would print an opponent’s face on a toilet seat (that actually happened, unfortunately for Richard Nixon), then check out the “Path to The Presidency” exhibit at the Bridgehampton Museum, Corwith House (details here)…. –Winning rave reviews: The play “Angry Young Man,” about a surgeon from the Middle East arriving in London in search of a new life. Catch it at Guild Hall in East Hampton this week or next…. –Not in shape yet for the summer? There’s hope! Hamptons Wellness Week (sort of like Restaurant Week, except for health and wellness) kicks off Saturday at 10 a.m. at Topping Rose House in Bridgehampton, details here. “The studio is cozy and the sequence is sweaty.” — Yoga Lila Montauk, promoting its classes on Instagram. They had us at cozy. Be the first to comment on "We Have Power Tools to ‘Lift the Cloud’"